There is a symbol that is universal to every language and geographic location: Coca-Cola! Across the Middle East, bottles of this familiar symbol of refreshment are sometimes brought to prisoners as a small comfort from workers who want to let them know they are not forgotten. Many prisoners in this region are arrested for immigration violations. They come from Sudan, Ethiopia, and Eritrea, fleeing their countries in the hope of finding somewhere better. Eritrea is a tiny nation on the Horn of Africa with about five-and-a-half million people almost evenly split between Muslims and Christians. 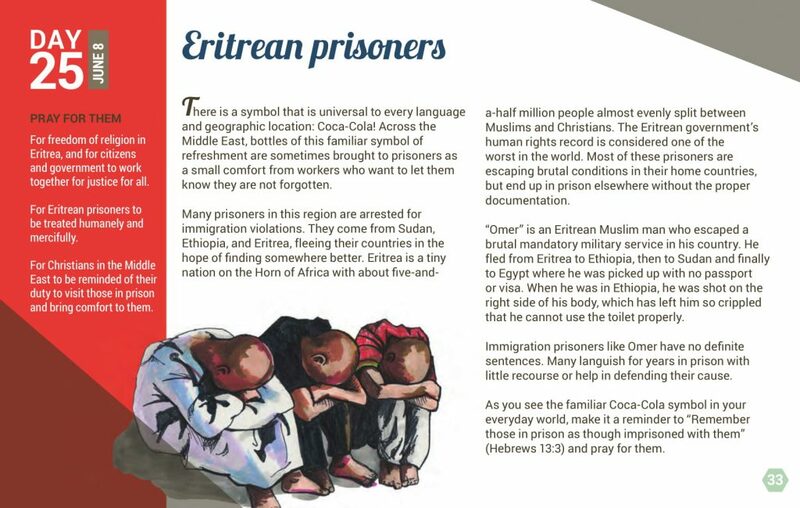 The Eritrean government’s human rights record is considered one of the worst in the world. Most of these prisoners are escaping brutal conditions in their home countries, but end up in prison elsewhere without the proper documentation. “Omer” is an Eritrean Muslim man who escaped a brutal mandatory military service in his country. He fled from Eritrea to Ethiopia, then to Sudan and finally to Egypt where he was picked up with no passport or visa. When he was in Ethiopia, he was shot on the right side of his body, which has left him so crippled that he cannot use the toilet properly. Immigration prisoners like Omer have no definite sentences. Many languish for years in prison with little recourse or help in defending their cause. As you see the familiar Coca-Cola symbol in your everyday world, make it a reminder to “Remember those in prison as though imprisoned with them” (Hebrews 13:3) and pray for them. For freedom of religion in Eritrea, and for citizens and government to work together for justice for all. For Eritrean prisoners to be treated humanely and mercifully. For Christians in the Middle East to be reminded of their duty to visit those in prison and bring comfort to them.